Erin Go Bragh! Celebrate the luck of Irish pride on St. Patrick’s Day by wearing this funky oversized green top hat as part of your leprechaun outfit! Fun party centerpiece, table decoration or St. Paddy holiday shamrock theme costume accessory. 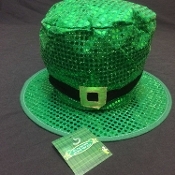 Why not strut your lucky stuff with this crazy jumbo unisex headwear at the Saint Patrick’s Day parade? Huge stylish kelly green fabric hat features shiny sequins, a faux gold buckle design and a big wire-lined brim. 14-inch Brim diameter. 7.5-inch High x 10-inch Wide. Hat is one size, fits most adults up to 56cm head circumference and stands approx 20cm tall. Made from sequined polyester material. *Best results achieved when top of hat is lined with cardboard, or stuffed with paper or plastic grocery bags. -One size fits most adults. -Approx 7-inch diameter opening, 23-inch circumference around inside of hat. -14-inch Brim x 7.5-inch High x 10-inch Wide. -Do NOT Wash. Surface clean only with soft damp cloth.